Microsoft Surface Go, the affordable Windows 10 tablet, is now available to pre-order from the Microsoft Store, Amazon and other online stores. There are two versions you can currently pre-order. 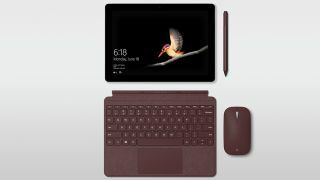 There’s a Surface Go with 64GB storage, 4GB RAM and an Intel 4415Y CPU for $399/£379/AU$599.99, and one with 8GB of RAM and 128GB of storage, which can be pre-ordered for $549.99/£509.99/AU$839.99. Both versions come with Wi-Fi connectivity. Models with LTE mobile data connectivity are expected later this year. The Surface Go is currently available to pre-order in the US, Canada, Australia, New Zealand, UK, Ireland, France, Germany, Austria, Belgium, Luxembourg, Netherlands, Switzerland, Denmark, Finland, Norway, Sweden, Poland, Italy, Portugal, and Spain.